Prompt Medical Care When You Need It Looking for an urgent care doctor in the Kensington, Bethesda, Chevy Chase, Silver Spring, Maryland and Washington, DC area? Look no further than Fast Track Urgent Care, one of the best walk-in medical centers in the Montgomery County, Maryland area! Fast and Convenient Care With our onsite pharmacy, you can get your prescription filled at Fast Track before you leave! Walk-In Urgent Care Near Washington, DC—No Appointment Needed! When you need to visit an urgent care clinic in Silver Spring, Kensington, and the surrounding Maryland area, come to Fast Track Urgent Care. We have two convenient urgent care clinic locations open during regular business hours AND on evenings and weekends—when your doctor’s office is closed! Convenient urgent care open near you in Silver Spring! Convenient urgent care open near you in Kensington! Call 800-417-1164 to reach either location! Our Doctors Our board-certified doctors and clinicians provide the same level of care you would get at your own doctor’s office. Urgent Care Clinic in Silver Spring, Kensington & DC Area! 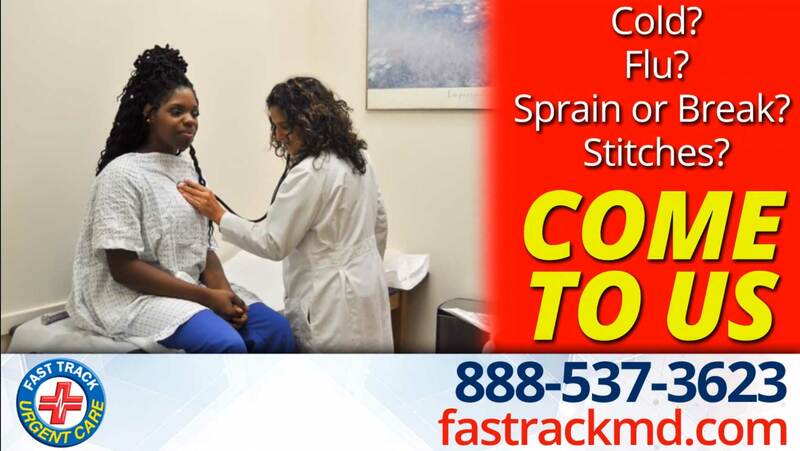 Fast Track Urgent Care’s two walk-in urgent care clinics, located in Kensington and Silver Spring, provide convenient, compassionate medical care at the same level you would expect from your doctor’s office. We are open 7 days a week and welcome all walk-ins. Don’t worry about making an appointment—just come right in and we will take care of you. When you need urgent care or walk-in clinic services in the Kensington, Silver Spring, and Chevy Chase area, come to Fast Track. You don’t need to call ahead. There is no need to make an appointment at our walk-in clinics. You can trust our staff. Our board-certified doctors and clinicians provide the same level of care you would get at your own doctor’s office. You won’t have to wait long. Typically, the wait at Fast Track Urgent Care is far shorter than the wait at the emergency room. Our friendly, experienced clinicians are board certified and can immediately assess your medical issue and provide the appropriate treatment. If you’d like more information about Fast Track Urgent Care’s medical services, please call 800-417-1164. Follow these guidelines to be prepared for your visit. In addition to our walk-in clinics in Silver Spring and Kensington, we also provide urgent care services for people who live and work in the following Maryland areas: Adelphi, Ashton, Aspen Hill, Beltsville, Bethesda, Brookeville, Burtonsville, Cabin John, Calverton , Chevy Chase, Cloverly, Colesville, College Park, Gaithersburg, Garrett Park, Germantown, Glen Echo, Glenmont, Hillandale, Hyattsville, Kemp Mill, Kensington, Langley Park, Laurel, Layhill, Norbeck, North Bethesda, North Potomac, Norwood, Olney, Potomac, Rockville, Sandy Spring, Scaggsville, Silver Spring, Spencerville, Takoma Park, and Wheaton. We also provide urgent care services in the Washington, DC area. If you have a life-threatening medical emergency, you should call 911 immediately and/or go to an emergency room.